Defend the Defenders, February 17, 2017: On February 17, Vietnam’s security forces in Hanoi and Ho Chi Minh violently dispersed the peaceful gatherings of local activists who want to mark the 38th anniversary of China’s invasion of the country’s six northernmost provinces. Hundreds of after activists gathered in Ly Thai To King memorial in Hanoi and General Tran Hung Dao memorial in HCM City to commemorate the thousands of fallen soldiers and civilians killed by the People’s Liberation Army of China during the one-month military invasion which started on February 17, 1979. Authorities in Hanoi and HCM City deployed a large number of police officers, plainclothes agents and militia to the two places. Shortly after activists came, security forces demanded them to leave the areas, saying they cause social disorders. A number of activists, including Nguyen Thi Kim Chi in HCM City and Nguyen Xuan Dien, Nguyen Lan Thang, Bach Hong Quyen, blogger Trung Nguyen, Dang Bich Phuong and Le My Hanh were detained by police. The detainees were released after being interrogated for hours in police stations. Many complained that police confiscated their cell phones and destroyed all data of the equipment, including pictures and videos of the gatherings. The governments of Hanoi and HCM City as well as other localities have deployed a large number of plainclothes agents to private residences of local activists since the morning of February 16, placing them de facto under house arrest to prevent them from taking part in the gatherings. The victims include prominent dissidents Nguyen Dan Que, Pham Chi Dung and Le Cong Dinh in Saigon, Nguyen Tuong Thuy, Le Anh Hung and Vu Quoc Ngu in Hanoi, and Catholic priest Phan Van Loi in Hue. 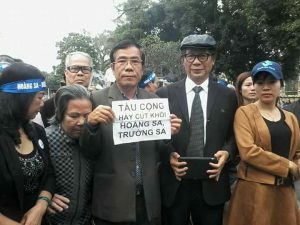 Some activists including Phung The Dung and Nguyen Van Phuong from Hanoi complained that police came to demand for administrative check during the late night of Thursday. One month earlier, on January 19, Vietnam’s authorities also violently suppressed peaceful demonstrations of local activists on the occasion of the 43rd anniversary of the loss of Hoang Sa (Spratlys) to China. On February 17, 1979, China sent 600,000 soldiers to attack Vietnam’s six northernmost provinces. During the month-lasting military invasion, the People’s Liberation Army of China, equipped with tanks and modern artillery, killed around 50,000 Vietnamese soldiers and civilians. The Chinese invaders also destroyed all infrastructure and houses in the areas. The two communist countries held the border war until 1989 before agreeing to cease fire and normalized bilateral relations in early of 1990s. In order to keep the country under a one-party regime, the ruling Communist Party of Vietnam has attached importance to its relations with China, considering the giant northern country as its closest political ally although Beijing has never treated Hanoi as its ally. Vietnam’s economy is too dependent to China. Bilateral trade rose 8% to nearly $72 billion in 2016, with Vietnam suffering trade deficit of $28 billion, according to the General Department of Vietnam Customs. Huge volume of Chinese substandard goods has flooded Vietnam while nearly all Vietnamese key infrastructure projects have been carried out by Chinese contractors who use outdated technologies and bring thousands of untrained workers to the project sites. China and Vietnam are disputing over Hoang Sa (Paracels) and Truong Sa (Spratlys) in the East Sea (South China Sea). Vietnam has peacefully administered the two archipelagos since the 17th century while China military invaded the first and some reefs on the second from Vietnam in the 1956-1988 period.